The success of healthcare organizations today is dependent on data-driven decision making. Inability to quickly access and process patient data due to outdated infrastructure may result in life or death situations. Healthcare organizations are making the shift to the cloud to enable better health outcomes. A critical part of that process is ensuring security and vulnerability management. The Healthcare Cloud Security Stack for Microsoft Azure addresses these critical needs, helping entities use cloud services without losing focus on cybersecurity and HIPAA compliance. Healthcare Cloud Security Stack offers a continuous view of vulnerabilities and a complete security suite for cloud and hybrid workloads. What is Healthcare Cloud Security Stack? 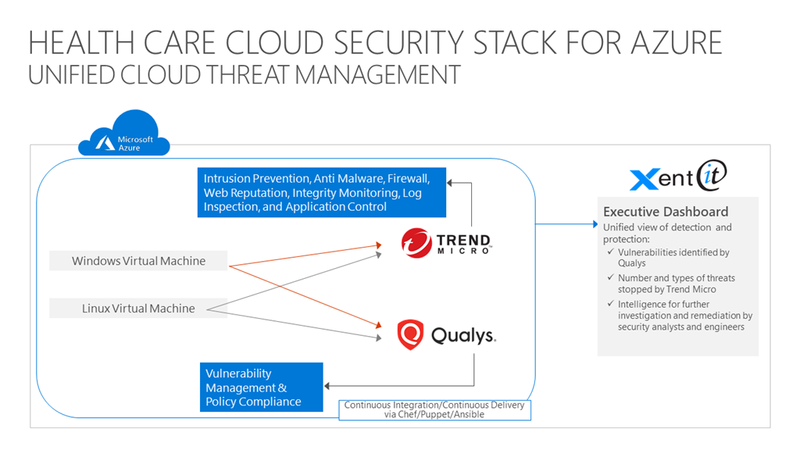 Healthcare Cloud Security Stack which is now available on Azure Marketplace, uses Qualys Vulnerability Management and Cloud Agents, Trend Micro Deep Security, and XentIT Executive Dashboard as a unified cloud threat management solution. Qualys cloud agents continuously collect vulnerability information and are mapped to Trend Micro Deep Security (TMDS) IPS. In the event that Qualys assesses a vulnerability and Deep Security has a virtual patch available, the Trend Micro Deep Security virtual patching engages until a physical patch is available and deployed. XentIT’s Executive Dashboard provides a single pane of glass into the vulnerabilities identified by Qualys. XentIT’S Executive Dashboard also provide the number and types of threats blocked by Trend Micro, as well as actionable intelligence for further investigation and remediation by security analysts and engineers. Modernization of IT infrastructure while maintaining focus on cybersecurity and HIPAA compliance. Gaining of actionable insights to proactively manage vulnerabilities. Simplification of security management to free up resources for other priorities. Learn more about Healthcare Cloud Security Stack on the Azure Marketplace, and look for more integrated solutions.